How to take NTC Sapati? NTC or Nepal telecom is one of the state owned telecommunication service provider in Nepal�with 91.49% of the government share. It has its central office at Bhadrakali Plaza,�kathmandu. It has branches, exchanges and other offices in 184 locations within the country. It is one of the service oriented company in Nepal. We can’t take sapati i.e. loan in NTC. Ncell is the privatey owned mobile network in Nepal. It is the first private company to operate GSM service in Nepal. It was frst called as mero Mobile and now it is Re-branded as Ncell. It is the largest�ISP�in Nepal with a subscriber base of more than 3 million users and is owned 80% by Axiata Group Berhad. It has been developed with different new technologies and thoughts which attract more people leaving behid other telecommunication networks. It provide different offers or provide different services in cheap cost i.e. voice pack, data pack in cheap cost and many other services. If we are at the place where we can’t find the recharge card and we have to do an emergency call in that case we can take loan of Rs 20. Ncell saapati allows prepaid customers to request for a loan when their current balance� is less tha or equal to Rs 5. To get Ncell sapati you can dial *9988# from your mobile phone. And the received Saapati amount is added to the main balance and allows the customer to make calls to any network, send SMS and to use mobile internet too snd we can use that money for other services too. The amount has no Expiry date as we don’t have to finish it in the limited time. Only prepaid customers who have been Using their Ncell sim for two or more than Two months are eligible to use this saapati service when their balance reduces to Rs 5 or less. And after when the customer recharges His/her balance the next time, along with the loan Rs 20 , a service fee of Rs 2.51(inclusive of Tax) will be deducted from new balance. If recharged amount is less than 20, the entire balance will be deducted and the remaining credit and services tax shall be deducted upon the next recharge. If the customer doesnot recharge the balance after using the services he/she will be still able to enjoy incoming service but will not be able to request for another Saapati until and unless the previous credit is cleared. The service can be availed by the customers at any time of the day and as many times as one wishes but to do so must have cleared the previous credit and service fee before requesting for another Saapati Recharge. 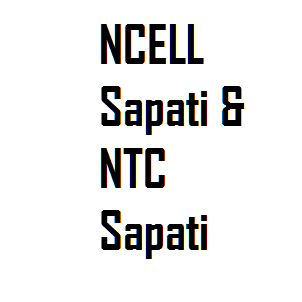 How to take Ncell sapati? Ncell is one of the service provider companies which provides a lot of different services to its customers in cheapest price. It provides different service� to impress their customer as well.� Beside these Ncell Saapati service helps people in many problems. As we don’t have to worry If we don’t have balance in our phone and we are in problem and have to call someone for help now its easy we can dial *9988# in ncell GSM sim and take loan of Rs 20.